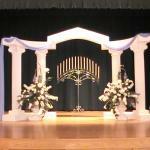 We offer a complete line of equipment that can be rented to minimize cost and maximize elegance. We will beat anyone's price! 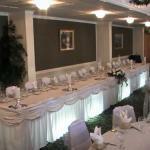 We have chair covers available in white, ivory, and black. 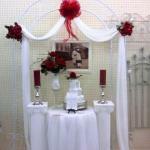 Included with every chair is a bow/sashe in your color and fabric choice. 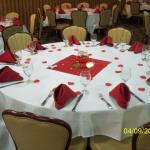 We are equipped to set up events from 50 people up to 300+. Please call for a free quote! Charger plates add that extra elegant touch to any table setting. These are available in red, black, silver, and gold to accent any and every color. 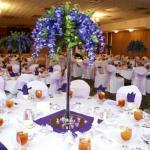 We offer many different types of centerpieces at rental and purchase rates to save you time and money! 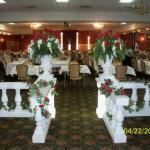 From simple fishbowls with candles to tall flower arrangements. 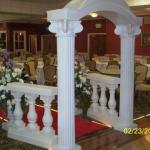 We will work with you to keep costs low. 3' sizes all in ivory/white color.